^^^^^^. Agree totally with @dtel. I notice a deference in both sound and picture. The studios are pushing streaming too. Streaming movies always come out before disks anymore. Sure it’s better money for studios without manufacturing a disc. I bought a Sony UBP X800 when they first came out. Worked for about a week, then kept freezing up during playback. I wanted to like it. It looked and sounded good. I guess I got a bad one. Finally took it back and bought an Oppo 203 before they shut down. Did not want to pay $500 for it, but I’m in this hobby and addicted. Love the picture on the oppo. Upgrades non 4-k discs very well. The Oppo doesn’t have apps, so I have a Roku Premier on the HDMI input. Hooked up with audio going to receiver and video to disc, both via HDMI out. Never seen that, had to try it. After hearing for years that HDMI cables are all the same, I found out you need upgraded cables for 4K because of the extra data transferred. I was debating on buying the 205 at the time I bought the 203. I think those were going for $1300 at the time, but had the added audio upgrade with good DAC’s. Wish I would have, those were going for outrageous prices in the months after Oppo shut down. After a couple years of using a bronze badge to get into qualifying and the garage area at Indy 500, I finally went to the race last year. Had decent seats but it was 91and Indiana humidity. We lasted about 150 laps and had to leave. Enjoyed the pageantry and what we saw of the race. The girlfriend and I were just wiped out under a canopy with no air circulation. Might go again this year with better seats. It is something to see. The amount of people is unreal. Before the race, we walked to the pagoda and took it all in. Great crowd, friendly. The bronze badge is one of the best bargains. I only used it for qualifying days and it gets us in the garage and up close. Got both me and girlfriend in on it. The ticket people don’t really look too close when going in. Got to walk around and absorb the history of the place when it’s not too full compared to race day. Visited museum. Also used badge to get into the Friday and Saturday concerts before the race. It wasn’t groups I would have paid to see. Last year Train and Blues Traveler played on Friday. Wasn’t really a Train fan, but became one. They had the crowd going. Played some Led Zeppelin songs that were spot on. Saturday they had Sam Hunt, who I thought I’d enjoy, but didn’t. Really a great experience. Definitely getting the bronze badge this year. I just like exploring the place without the crowd and visiting the garage. Best bargain in racing. Played golf there in April. The course has 4 holes inside the race track. Nice course. I had an RC-52 with RF-52II . I currently have a RC-62 II with another system. The 62 is a fuller sound, one of the hidden gems of Klipsch. I just looked, and there are new ones out there. Search for “Klipsch RC-62 II” on amazon and eBay. $250-285. They’ve been discontinued, but there are new one out there. I bought mine from Fry’s about 8 months ago. Getting off track here. Everything you say about the RP600’s applies to my previous generation RP-160M’s. Fantastic speakers for the price. I bought them for my hopefully soon retirement place down south til I get my main system down there. Paired them up with a cheap RC62 center and they sound awesome for the price. As you said, soundstage is amazing and they sound good as LR for home theater. 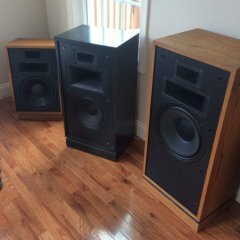 Anyone at at work that talks about getting home theatre system I recommend these to them. Great place to start with sound system. I have these for some RP-160M, same footprint as yours. Monoprice. About $50 a pair. Glass and look good to me. No wobble. They are on Amazon also https://www.monoprice.com/product?p_id=12281 sorry picture isn’t the best. I bought a Marantz from Accessories 4 Less about a year ago. It was just a five channel compact version for a place I have down south. It came to me pretty beat up. The badge wasn’t attached and the unit was scuffed up. One of the antennas for the WiFi was broken. I plugged it in and tried it. It sounded ok, but I couldn’t get past the way it looked. It had all the paperwork that said it was refurbished by Marantz. I called A4less up and they immediately took it back and apologized for my inconvenience. Money was back in my account as soon as they received it. So I’m happy with their customer service, disappointed that no one saw how beat up the unit was at Marantz or A4less. Recently, my couple year old Denon AVR4200 HDMI inputs started dropping out one by one. It was a few months out of warranty. I bought a Marantz SR6012 refurbished from Safe and Sound. I was scared off A4less after my prior experience with the unit itself, not the customer service. Paperwork said it was refurbished by Marantz also. This unit looks brand new and seems to work well. Different experience, but that’s the chance with buying a refurbished unit. @svaraj I have Forte III also. When I got them, I had a 450C. I felt that was lacking. Got ahold of @MetropolisLakeOutfitters and he suggested the RC-64II. It was a big difference from the 450C. I realize it's probably not the perfect match, but I have no complaints. The RC-64 fits in my setup. I'm happy with it. I also have an RC-62II in my other setup. It is stronger than the 450C for a center. Much clearer dialogue for movies with the 64II being top for what I've listened to. Looking at your picture, I would think a Heresy III would fit your setup and probably be the best option. Call around, you should be able to pick a new one up for a good price. I do have a cherry wrapped R-112Sw I bought in 2017 during prime day. Only had them in 12”. Same wrap as reference series cherry. @KJH The original natural cherry Forte’s were mine. No. 1 - Cory is great to work with. I recommend him. Very knowledgeable in No. 2- The Fortes were very light when I first received them. That’s a Heresy in the old cherry sitting by the Forte in the picture. It was unbelievable how much darker they became in a few months. They looked like a pine finish when I first received them. They got darker unbelievably fast. All my furniture matches the old cherry finish that the Heresy had. I had Cory special order the new Fortes in the darker cherry color. Everything’s a match now in the room. If you have any doubts, order in cherry from Cory. I think I got them in 5 weeks. Cory can correct me if I’m mistaken. Also ordered a 64II center from Cory. The Forte’s sound fantastic in any finish. I highly recommend Cory. Give him a chance before you order. I wish I would have found him when the Klipsch addiction started. Unfortunately I started small and upgraded. Get the Fortes first and you’ll be happy. Im waiting for the heritage subs to come out so I can order those in cherry and have the matching set. What bases do i need for RP-160M? I used Monoprice stands for mine. Sit on top perfectly. $55.00. Well made, solid stand. I don’t have the speakers attached to stand. The speakers sit almost perfectly on them. Look at them at monoprice.com or amazon. i removed the bases on the speakers.